Ryo Central: Would a Google Reader Discontinuation Harm RSS In General? Would a Google Reader Discontinuation Harm RSS In General? You heard it again these days. Google Reader seems to be on a low priority at Google. A hiccup for some, that left Reader unusable for some hours sparked more fear about it. Rumors are it won't take too long before Google abandon their RSS-Reader. Some users are relying on Google Reader. I am an example for this. Almost all my research for the netcasts and often for my blog posts are done within Google Reader. What will happen to RSS without it? There are alternative readers. A few not so good online, a few good as applications. More or less. What these days are out as newsreaders is at best, for a casual viewing of news. For a complete list of new articles from specific sites that you select, and not the vendor of the app, the tools are almost all not usable. Another problem is, if Google Reader would go away, important sites might abandon their RSS-feeds. While not everone is using the reader from Google, it's the major part. So, many webmasters would not see any sense in providing RSS any longer. Other than that, some blogs and sites rely on Google Reader for their content. With different tools on the net, you can curate a stream in Reader and easily publish links etc. to your site. Making a site to track your written articles all over the net e.g. I think if Google leaves the RSS train, it will die out quickly. With unknown consequences. Yes, it's true that social networks, especially Google+ and Twitter, are said to be the successors. That isn't true. You still need something to transfer your content from different sites to your feed. Manually? Come on. Most of the content on Twitter by far are fed in by RSS tools. So how is this going to work then? Google+'s Write API? Still not there. 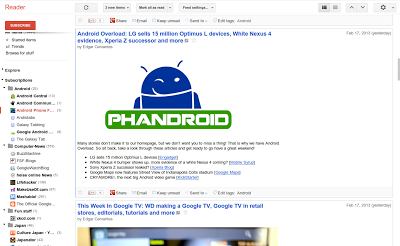 I can't even share a blog post automatically from Blogger, Google's blogging platform, to Google+. I have to share it after I wrote the post by manually clicking around in a box. And on mobile? Not even a box. This is a disaster. The pure rumors could even lead to a decrease of RSS usage from the sites. Some may think it isn't important anymore. At the moment they would recognize it by a dropping number of readers. For now. But the uncertainty could be a bad sign for the future. I think RSS not even have reached the top potential. Think about what you can do with it mobile-wise. Less traffic, faster access. But maybe that lack of progress is already a sign for the webmasters to switch to a "do not care" position deep inside their programmers heart. So please save RSS. And I hope Google keeps their reader, because it's a indispensable interface for me to efficiently consume information from the net. It would be a big step backward for the whole flow of information.